I created this Chicken with Beans and Tomatoes dish yesterday in under a half hour. It was long day so I needed to put something together quick. It’s a healthy recipe pack full of protein and nutrients. I always stress that fresh ingredients are the best but in this case I used canned everything. When you cook as much as I do sometimes you have to give in to convenience. 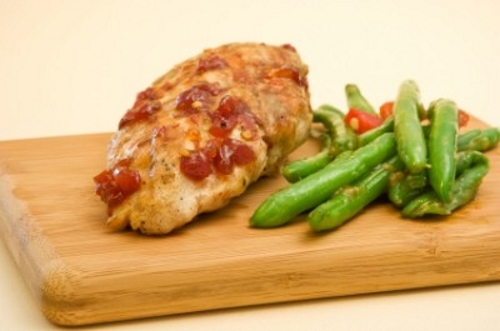 This Chicken with Beans and Tomatoes were seasoned with a few dried herbs and left to simmer in a tomato broth mixture until the chicken was tender and juicy. In a large frying pan, sauté the chicken breasts in the oil until they are browned on both sides. About 2 to 3 minutes on each side. Add the onions and garlic to the pan and sauté until translucent. Stir in the string beans, lima bean, tomatoes and broth. Season the mixture with the thyme, oregano and basil. Cover and cook for 15 to 20 minutes until the sauce is slightly reduced and thickened. Plate the bean mixture and serve with the chicken on top.